If you are searching for a stylish navigation menu to boost the functionality of your default WordPress menu then, let’s get started with our handpicked collection of the best WordPress off-canvas navigation menu plugins. These plugins will let you create elegant fly-out menus that can either used as the primary (main) menu for your WordPress website or as the secondary navigator to support your existing WordPress menu. In any way, you can make your contents easy to navigate to your audience and boost the overall engagement rate of your WordPress website. Now let’s talk about some of the popular WordPress off-canvas navigation menu plugins available on the internet. 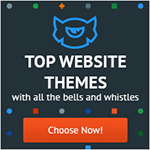 These plugins are well tested and well maintained (updated regularly) by their owner. 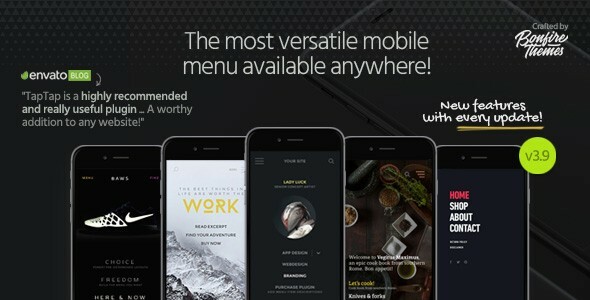 Moreover, these plugins contain quality features to create a stunning fly menu without touch any codes. The first pick of the collection is WP Fly Menu. 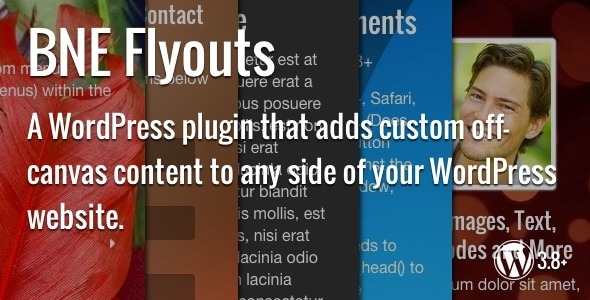 It is a premium WordPress plugin to integrate your default WordPress menu and add a responsive flyout menu on your WordPress website. 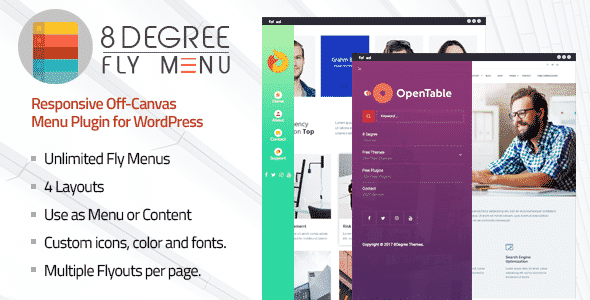 The plugin consists of 4 different layouts and 28 templates that can be used to create unlimited number of a fly menu. Moreover, you can also add different additional menu elements such as menu icons, taglines, pseudo grouping header and many more on your menu to make it more visually appealing and engaging to your audience. My next pick for the list is 8Degree Fly Menu. It is a fully responsive WordPress navigation menu plugin to style up your WordPress website by adding a visually appealing off-canvas menu. The navigation structure can either used as your navigation menu or as a sidebar content to promote your products/services. 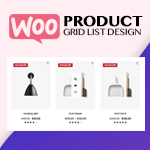 The plugin is integrated with WYSIWYG editor to add different elements such as the custom images, taglines, pseudo header and a long description to highlight your product in the flyout menu along with different effects. 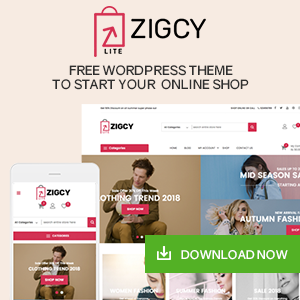 Moreover, the plugin also contains 4 different layouts and 28 menu templates with cool backgrounds to choose the best menu design for your WordPress website. If you are looking for one of the best selling WordPress off-canvas navigation menu plugin then, Superfly is one of them. It can be used to generate efficient to add vertical push/sliding/static navigation, icon toolbar or full-screen menu as per your preference. These menus can be used as the standalone navigator or the secondary compliment to the main menu of your WordPress website. In any way, the flyout menu created by this plugin makes your site’s navigation much easier and user-friendly to all types of viewing devices like desktop, laptop, mobile or tablets. My next pick for the list is TapTap. It is a highly customizable WordPress menu plugin designed for creating a perfect navigation menu for any types of viewing devices. You can choose any of the 6 menu button styles that consist of a wide range of color to build the most unique flyout navigation menu with the best user experience. Last but not the least my final pick for the collection is Flyouts. 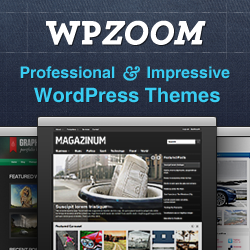 It is a premium WordPress plugin to add off canvas contents for WordPress website. The contents may include contact forms, custom menus, banners, social links, social feeds, testimonials, biography, or even custom data. It is a highly configurable and customizable plugin that consists of endless possibilities. You can add different trigger options or add a stunning hover animation effect on each of the fly menus to provides a great user experience to your site audiences. These are the collection of the best WordPress off-canvas navigation menu plugins. 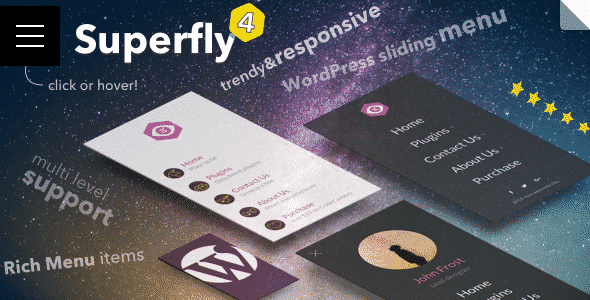 These plugins are packed with tons of qualities of features to create and stunning fly menu or flyout content on your WordPress website. 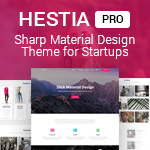 So, if you want to add a stylish navigation menu to provide easy navigation user experience then, you can use any of the above-mentioned plugin at a reasonable price. Next articleHow to Add Content Locking to All WordPress Posts? Hey Buddy!, I found this information for you: "5+ Best WordPress Off-Canvas Navigation Menu Plugins (Premium Collection)". 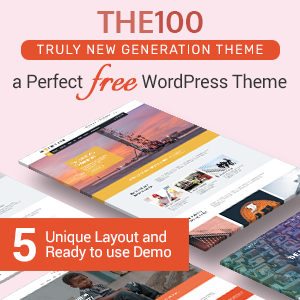 Here is the website link: https://wpallclub.com/best-wordpress-off-canvas-navigation-menu-plugins/. Thank you.